This information is provided by Impression Sailing Ltd. Please confirm all details direct with them prior to booking. Yachting Limited neither endorses Impression Sailing Ltd nor guarantees the accuracy of this listing. 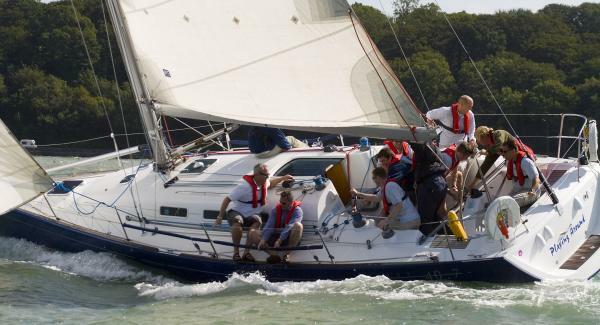 Impression Sailing have been providing the highest quality racing and cruising yachts for both private & corporate clients from their Hamble base for over ten years. With the largest fleet of high performance Beneteau 40.7's, we can cater for 5 -200 people. With yachts and powerboats ranging from 26ft to over 60ft to charter, we can always find the perfect vessel to meet your exact requirements, as well as organising teambuilding or hospitality programmes. Our wealth of experience enables us to organise your charter down to the smallest detail, whether it be a weekend cruise, corporate regatta or a Fastnet campaign. Our ability to offer a totally bespoke package enables us to offer the variety and flexibility that is so often required in today's market place whilst ensuring fun is had by all. The details of the yachts below are indicative. The specifications (including the number of berths, cabins and heads) of Impression Sailing Ltd's yachts may vary. Please confirm the details with Impression Sailing Ltd. There are no user reviews for Impression Sailing Ltd yet. Be the first to add a review.